Scribd is a social sharing tool that allows you to upload documents to share. It’s a great way to push assignments out to students because they can download documents from Scribd in a variety of formats, including those used by mobile devices. If you use Blackboard, and you want to upload your class notes to Scribd and then share them in Blackboard, all you need to do is to copy the embed code from Scribd and paste it into your Blackboard course. Don’t forget to toggle your editor over to html mode first, or you’ll just get a bunch of jibberish. These lists are always funny and disconcerting. Sometimes they are downright shocking. It’s important to stop and think where our students are coming from, though, especially when designing course materials. If you want a little more serious-minded information about the next generation, take a look at the Pew Internet reports on millennials. Three-quarters have created a profile on a social networking site. One-in-five have posted a video of themselves online. Be sure to take the quiz, “How Millennial Are You?” This places me, amazingly enough, right where I actually fall age-wise on their scale, as a Gen Xer. Plenty has been said and plenty has been studied about working with the Milliennial generation, but for a quick intro, consider this clip from 60 Minutes. And so it boils down to “lifestyle matters more than anything else.” What does that mean for the classroom? To start, Flickr photos can be used to spruce up the appearance of your Blackboard class and to make it appear more engaging. 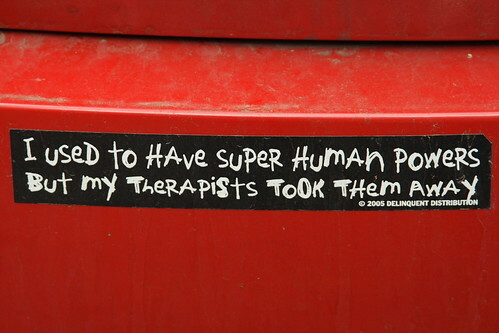 I found this photo by going to search.creativecommons.org, clicking on Flickr, and typing in “psychology” as the search term. Notice that it is licensed by the Flickr user Esparta under Creative Commons terms that do allow for sharing. Starting out by searching for Creative Commons images can help you avoid sharing photos that are copyrighted in ways that ask you not to repost. When I went back to the Creative Commons Flickr search and typed in “Freud,” I did find a picture of Sigmond Freud that was available to share. I also found a photostream called “Psychology Pictures.” That gave me access to a number of images that could be used in a unit on psychology, including this B.F. Skinner exhibit of pigeons play ping pong. Anything you say is bound to be more interesting once you have the pigeons there to set it up. You can find any number of images on any number of subjects in Flickr (and through Creative Commons) that, when integrated into your Blackboard course, can clarify or enhance information (or perhaps just make everything a little more entertaining. You can also upload your own photographs into Flickr and embed them from there into Blackboard. This is often better than uploading pictures directly to Blackboard because Flickr is made for handling images. They load faster from Flickr and are easier for students with slower connections to view. Plus, Flickr allows for easy editing of images through another online tool called Picnik. Just go to www.flickr.com and sign up for a free account to get started. Paid accounts are also available if you want to upload more images than the free version allows. I hope this isn’t how you feel about redesigning your Blackboard course. Blackboard 9.1 includes some quick-embed options for pulling content in from social sharing sites like YouTube, Flickr, and Slideshare. I laughed when I saw how they used the term mashup, though I refrained from actually saying the word “lol” out loud. I’m willing to concede that they aren’t wrong to call this a mashup, but I still think it’s funny. I think they are trying to lend some geeky net cred to what amounts to taking a task that could always be done and making the fact that it can be done more obvious. That’s okay. It’s absolutely okay, but I’m still going to talk about why it makes me giggle. First, a mashup is a combination of information from two or more sources. In web development terms, that might mean taking data from two different applications to build a third. In creativity and communication terms, we hear “mashup” most often when applied to mixing video or sound or text or image from more than one location together in order to make something new. Here’s a classic example in this Buffy meets Edward Cullen Twilight mashup. This video makes me giggle too. It does, however, represent my basic understand of what a mashup is. A new creation made by combining elements from at least two separate sources. A creative act. An act of making new meaning simply from the way materials are combined. What does that have to do with Blackboard mashups which are just a matter of pulling in embedded content from other places? Hmmm…well…you actually can call it a mashup simply because web content from Blackboard and web content from another site are combined on one page in a way that appears as though they were made together. I’ll buy that, but it’s a lame use of the word mashup because embedding in and of itself doesn’t necessarily create new meaning. I can embed YouTubes all day long on this blog, but if I haven’t made them part of something else, I haven’t created new meaning. I’ve just shared the same meaning in a new place. I’m more comfortable thinking of YouTube embeds in Blackboard as mashups if I’ve actually integrated them into an assignment I have created, if I’ve combined them with other types of information, and if I’ve written my own materials to go with them. Keep that in mind when develop materials for online classes. If you create your assignment and drag Flickr photos and/or YouTube videos into your assignment as integrated aspects of some larger creation of your own, then you have a mashup. Otherwise, just enjoy the fact that it is so easy to pull external materials into Blackboard. You do this by going to “Build Content” and “Mashups.” From there you, select YouTube, Flickr, or Slideshare from a menu, and search for content on the selected site. Once you’ve found what you want, you hit “select” and follow the prompts to format your viewing options. Hit “submit,” and you’re done. Easy. You can also embed content by copying and pasting the embed code from the social sharing site and pasting that code into your text editor while the editor is in html mode. You can do that in Blackboard 8. The different is just that Blackboard 9.1 prompts you to add content from social sharing sites by providing the mashup menu. When I first started teaching, students wrote a lot of drafts out by hand before typing because access to typewriters and computers was much more scarce than it is now. The first year or two we switched over to writing first drafts on a computer, I noticed a huge upsurge in semi-colons. Students hardly ever used them before, and then suddenly they were everywhere. I attributed that to the fact that they were visually available as an option on the keyboard. Students felt prompted to use them. Maybe the Blackboard mashup menu will work the same way. Maybe Flickr pics will suddenly be everywhere in online classes because teachers feel prompted to share them. Maybe so. It will be interesting to find out. Marshall University has put together some charts on the differences in Blackboard 8 and Blackboard 9. Video tutorials on using Blackboard 9 are available through the Blackboard On Demand Learning Center, and all sorts of promotional videos on the joys of Blackboard are available through BlackboardTV on YouTube. More information is available through the Talk to Bb site. You can also request a 30 day trial preview of the latest release of Blackboard (which I am in the process of doing right now). Meanwhile, here’s a nice little video introduction to Blackboard 9.1 from mamabutton on YouTube. The Mississippi Virtual Community College is upgrading to Blackboard 9.1 from Blackboard 8 something-or-other presumably by the fall semester. I say presumably because we were told the change would happen in time for summer sessions, and it didn’t quite work out. I don’t know the details. I just know there was a failed attempt. We’re talking about a system large enough to serve 15 colleges at once. I for one am willing to accept without questions that changes to a system like that are complicated. I’ll leave it at that. From the instructor side, though, this is all somewhat anti-climactic. Instead of a dream deferred, we have a job deferred in figuring out how to reconfigure what we are doing for a version of our course management system that appears to include that biggest changes we’ve seen yet in switching from one iteration to another. More time to grumble, in other words. Everyone I know complains about Blackboard. It’s almost a hobby, maybe a sport. We have this massive corporate tool that dictates our lives as teachers. What’s not to complain about? Some complain every time there is a change in versions because they don’t like having to relearn what they are doing or redo what they’ve been delivering. Others complain because once again Blackboard has disappointed by not bringing the most sophisticated possible technologies to the table. The discussion board is the part that drives me nuts. We’ve seen changes from time to time in the Bb discussion board, but no matter how many times it is updated, it is still a more primitive tool than those that were available for free ten years ago. But that’s neither here nor there. Blackboard is what it is, and we are driven by a need to use a uniform system for all students across all of the 15 two-year colleges in our state. Thus, when Blackboard changes, we change. In that spirit, I’ve been trying to get a handle on what the changes actually are without yet having access to the new version. It’s a little like my attempts to guess what the iPad would be like before it came out, only without the daily articles from Mashable to pump my excitement levels up. There are changes in the functionality. You access the controls in a different way. You toggle back and forth between edit modes and student views in a different way. It looks like you can also structure your classes a little differently, layering content areas in ways that didn’t exist before. Bb 9.1 also offers more social media tools–blogs, journals, and wikis, as well as easy ways to pull in content from sites like YouTube, Flickr, and Slideshare. The functional changes I’m not worried about. Blackboard isn’t designed for computer programmers. It’s designed for averages students and teachers. It’s designed for intuitive navigation. There isn’t anything in the way the new version operates that will be difficult to figure out. It might require memorizing some different paths to the same information, but those paths won’t be difficult to locate or follow. I’m more interested in the concepts represented in all these changes. Blackboard assumes social media is reinventing the way online classes are delivered. As well they should. Social media has reinvented the way people communicate in general. Online classes have to reflect this if they want to keep up, if they want to continue to attract students. I’ll write more in other posts about using blogs and wikis with students. I want to talk now about pulling in content from social sharing sites like YouTube and Flickr. In truth, you could do this all along. All you ever had to do to embed a YouTube video in a Blackboard course was to copy the embed code from YouTube and switch to html mode on the Blackboard editor to copy it in. This is what you might continue to do in order to embed content from sites that aren’t included in Blackboard’s “mashup” menu. Prezi, for example, isn’t included, but you could still embed a Prezi by copying and pasting the html. So in 9.1, Blackboard has taken a way of sharing outside content that was always possible and created a prompt for it along with a menu of popular options. They call these mashups. Again, more about that in a later post. For now, the point is that 9.1 assumes online courses are integrating materials from social sharing sites and assigning social networking activities. It assumes students are working on group projects, that they are expressing opinions and commenting on one another’s opinions. It assumes the classes are highly interactive and that content is delivered in a variety of mediums–audio, video, graphic, as well as text. Thus, making the switch to Blackboard 9.1 mainly requires that we ask ourselves what we aren’t doing now with multimedia that we could be doing, what we aren’t doing now with social networking activities that we could be doing, and how any of these changes might benefit our students. That’s a lot to ponder, but it’s well worth pondering. It’s all about making the students feel more involved in the class and more involved with the subject. That’s what teaching is always about no matter what the classroom happens to look like. It’s time to quit worrying and learn to love the Blackboard. These changes are going to be good. I’m in the process of setting up another site, Trailing Eudora, and the way I have it set up requires that I apply a thumbnail image to each post. That stumped me a little because the right image can be trouble to find or create. Then of course there’s the issue of whether or not the image is actually legally or ethically available to post once it’s been found. Plus, though I do appreciate the use of images in blog posts, I don’t feel the need to always have one every single time. Sometimes I’d rather have just a colorful text box with a short excerpt from my post calling attention to it rather than a photograph, I told myself as I contemplated the how of coming up with a thumbnail image for every single post. That’s when it struck me that the easiest way in the world to create a colorful text box that can be posted to a blog as an image is to make it as a slide in PowerPoint or Keynote. 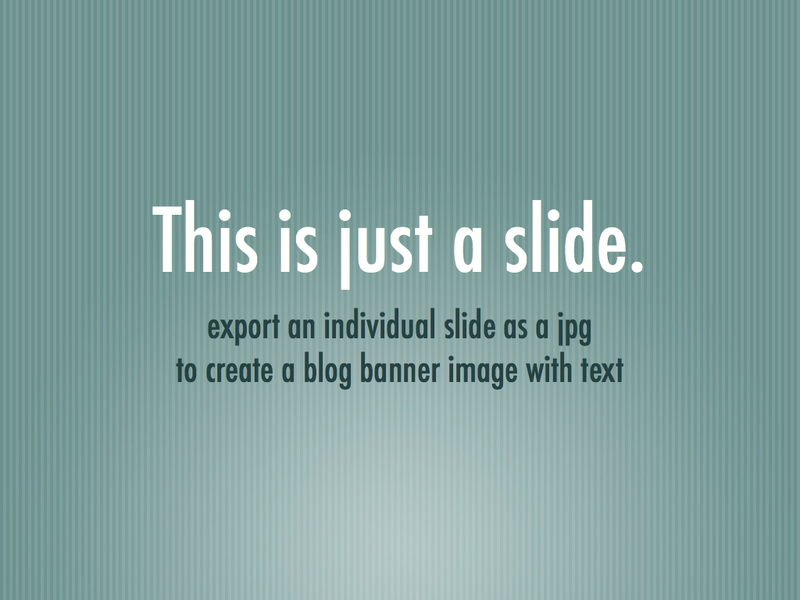 From either program, an individual slide can be exported as a jpg image. And the same technique can be applied to adding text-based images to flyers or other documents as well. Sometimes the easy answer is really the best one.